Tall, slow-moving and gray, he has big cartoonish eyes that disguise something unique about the newest employee at Giant Food Stores: Marty is deliberate and relentless, and — unlike his fellow employees — he has the ability to work a seemingly endless number of hours without pay. Giant isn’t the only retailer turning to robots to police its many aisles. In December, Walmart announced plans to place 360 autonomous robots inside stores across the country by the end of January. I’d trip over the robot. It turns out that even robots are having a tough time holding down a job. Japan’s Henn-na “Strange” Hotel has laid off half its 243 robots after they created more problems than they could solve, as first reported by The Wall Street Journal. One of the layoffs included a doll-shaped assistant in each hotel room called Churi. Siri, Google Assistant, and Alexa can answer questions about local businesses’ opening and closing times, but Churi couldn’t. When hotel guests asked Churi “What time does the theme park open?” it didn’t have a good answer. That was a problem because Churi was supposed to help ameliorate the Strange Hotel’s staff shortage by substituting in for human workers. Two velociraptor robots positioned at check-in were also decommissioned because human workers essentially had to do their jobs for them and photocopy guests’ passports manually. Two robot luggage carriers could only reach about 24 of the over 100 rooms in the hotel and failed in rain or snow. They would also often get stuck trying to pass by each other. The hotel’s main concierge robot also didn’t know how to answer questions about flight schedules and nearby tourist attractions. It has since been replaced by a human. The good news- a new garment factory is opening. The bad news- all the sewing is done by robots. The idea behind one textile manufacturing plant of the future was dreamed up in a one-story industrial building on Atlanta's west side. Twenty-four "Sewbots" will soon churn out a shirt about every 30 seconds in a new factory in Arkansas. The fully automated assembly line in Little Rock is a closely watched advance in the U.S. textile industry, as machines produce more clothing. Suzhou Tian Yuan Garments Co., the Chinese owner of the new Arkansas plant, has cheap reliable power, proximity to cotton and well-off customers. And it opens the way for American-made robots to compete with low-cost foreign labor, the Atlanta newspaper reported. The Arkansas plant is expected to open later this year and employ 400 workers. Many of the positions are for technicians with coding and electro-mechanical knowledge. How McDonald's will ask "You want fries with that?" in the near future. I used to employ the person the one on the back is replacing. Put the box ON the conveyer, not 12 inches ABOVE the conveyer. Damn robot does the same job exactly the same way. Now the robots are taking jobs from dogs. While some may consider cheating a senior to be cruel, a dement person lacks the ability to properly care for a real dog. Carers needs to look for both the patient and the assigned pet while their time is restricted. I guess in this case I am in favour of a robotic supplement. Speaking from experience, they won't be widely used. They'll be priced for the commercial market - nursing homes, hospitals - meaning they'll be priced far beyond what the typical family can afford. There are very basic models on the market now that run about a hundred bucks. This is the problem with a lot of assistive medical devices. There's stuff on the market that would be a godsend to home caregivers, except that it's absurdly unaffordable. Lift chairs are one example. These are devices to help get a person back up after a fall. The simplest ones are fabric air bags that you connect to an inflator. Lay the bag flat on the floor, roll the person onto it, turn on the inflator and it inflates to chair height. Cost: $1200 just for the air bag, $1600 for the bag + inflator. A more sophisticated lift chair is an actual battery-operated chair that dissasembles so you can lay the seat flat on the floor, roll the person onto it, then attach the backrest and support arms, and press the button, whereupon it lifts up into chair position. Cost: $6500. You can't persuade me that a fabric air bag's cost to manufacture requires the $1200 price. No, it's the targeted market that determines what the manufacturer will charge. "in blue collar occupations such as machinists, assemblers, material handlers and welders. Workers in these occupations engage in tasks that are being automated by industrial robots, so it is natural for them to experience the bulk of the displacement effect created by this technology." The adverse effects of automation fall disproportionately on the voters who cast most of their ballots for Trump in 2016: White men, much more than women, and whites without college degrees. Robots are people too, my friends. Yeah - they must be female, they cost money to support, SCOTUS will agree with you and let them vote! The robots are coming for Walmart workers' jobs, with the retail giant saying it plans to add almost 4,000 robots to its stores and facilities as it seeks to remove human workers from routine tasks like scrubbing floors. The company said the plan is part of a goal to shift human workers to customer-service roles, such as "engaging with customers," according to a blog post. 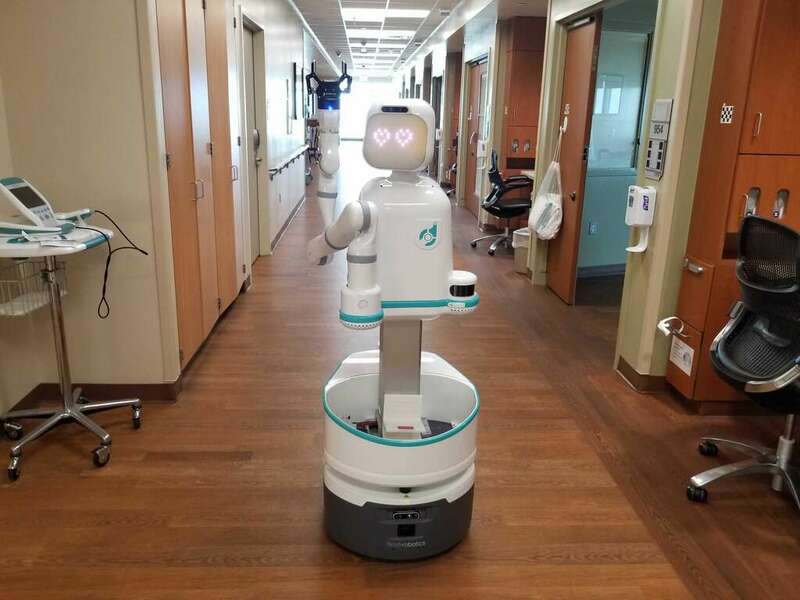 The new robots include the "Auto-C," which polishes floors, and the FAST Unloader, which scans and sorts items unloaded from delivery trucks. The investment in automation comes as the retail giant has pledged to boost worker wages, pledging $2.7 billion over two years to boost pay as well as training and education. Robots, while requiring an initial investment, promise lower labor costs because they don't require benefits, while they can often perform the same job in much less time than a human worker. Walmart said the Auto-C will replace a store worker who typically spent two hours polishing floors with a scrubbing machine. Comparing the robots to sidekicks like R2D2, the company framed the investment as helping workers shift into roles with fewer monotonous, repeatable tasks. Each robot can cut down hours of work done by a human into a few hours, or assign fewer humans to certain jobs, representing potential savings given the retailer's 4,600 stores, the Wall Street Journal noted. All these prototypes rely on a handful of converging technologies—artificial intelligence, robotics, big data, G.P.S., machine vision, drones, and material science—that have been slowly finding their way onto the farm. Many row-crop farmers in the U.S. employ G.P.S.-guided tractors to lay out their fields. John Deere has been offering G.P.S. for its tractors since 1997. At first, satellite-assisted steering was simply a way for a farmer to keeps his rows straight, rather than rely on a tractor driver’s dead-reckoning skills. But for forward-thinking farmers G.P.S. offers much more than straight lines. A G.P.S.-planted farm provides a foundation on which to build a whole new class of automated farm tools that can use artificial intelligence to solve the hard problems that twentieth-century agricultural automation could not. 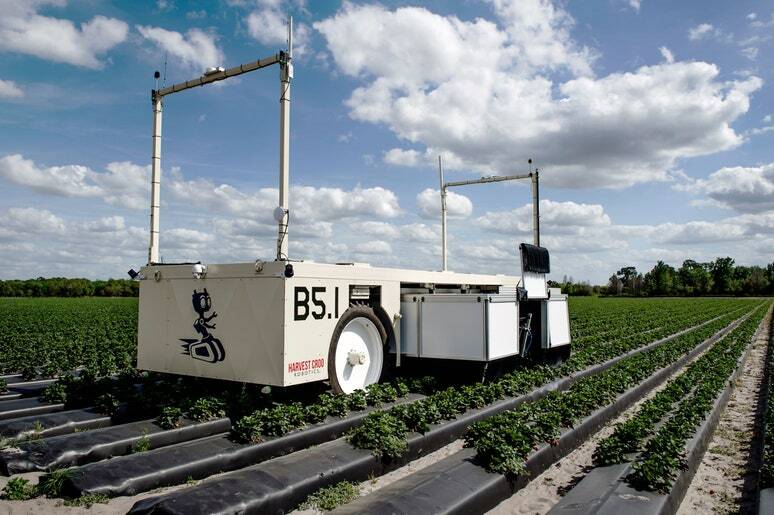 o far, Berry 5.1 has cost nearly ten million dollars to develop; Wishnatzki raised most of the money from investors, many of whom were other strawberry growers, including the industry giant Driscoll. “My closest competitors realize we’re all in the same boat,” he told me. His partner, Pitzer, who is forty-nine and previously worked at Intel, helped produce “Battle Bots,” the gladiator-style television show in which warrior robots fight one another. The two men are the co-founders of a tech startup called Harvest croo, which stands for “computerized robotic optimized obtainer.” They hope to have an “alpha” prototype of the harvester ready for commercial use by the end of this year—an ambitious goal. The plan is to lease the machines to farmers for the same amount as or less than they are paying for labor now. This way, in theory, a large capital investment isn’t required of the individual farmers. The machine was reset, rolled back into the field, and positioned over four rows of strawberry plants, and the demonstration began. Except the robots didn’t begin by touching the plants. Whereas human pickers, who need only a few seconds per bush, use most of that time working their hands through the leaves, each robot, which spends eight seconds per plant, devoted seven and a half of them just to hovering about a foot above the bush, motionless, as though contemplating it. Two stereoscopic cameras per robot, equipped with multi-spectrum and infrared vision that can see berries through the canopy, scanned the plant in a second and a half, and made a virtual 3-D map of it. (If the harvester has encountered the same plant before, it can add this data to what it has already learned about the plant, using a high-speed link to connect with the cloud.) The system then ran all the information through its algorithms and targeted those berries at peak ripeness, based on color, size, and the amount of time that the fruit had already spent on the plant.